Prior to American sanctions, socialism in Venezuela had reduced inequality and poverty whilst pensions expanded. During the same time period in America, it has been the absolute reverse. President Chavez funneled Venezuela’s oil revenues into social spending such as free+6 healthcare, education, subsidized food networks, and housing construction. In order to fully understand why America is waging economic war on the people of Venezuela one must analyse the historical relationship between the petrodollar system and Sanctions of Mass Destruction: Prior to the 20th century, the value of money was tied to gold. When banks lent money they were constrained by the size of their gold reserves. But in 1971, U.S. President Richard Nixon took the country off the gold standard. Nixon and Saudi Arabia came to an Oil For Dollars agreement that would change the course of history and become the root cause of countless wars for oil. Under this petrodollar agreement the only currency that Saudi Arabia could sell its oil in was the US dollar. The Saudi Kingdom would in turn ensure that its oil profits flow back into U.S. government treasuries and American banks. Within the last two decades Iraq, Iran, Libya and Venezuela have all threatened to sell their oil in other currencies. Consequently, they have all been subject to crippling U.S. sanctions. Over time the petrodollar system spread beyond oil and the U.S. dollar slowly but surely became the reserve currency for global trades in most commodities and goods. This system allows America to maintain its position of dominance as the world’s only superpower, despite being a staggering $23 trillion in debt. The gruesome images that emerged from the rubble were broadcast through television sets across the world and caused unprecedented outrage. The political backlash forced U.S. policy makers to devise a more subtle weapon of mass destruction: economic sanctions. “atomic explosive weapons, radioactive material weapons, lethal chemical and biological weapons, and any weapons developed in the future which have characteristics comparable in destructive effect to those of the atomic bomb or other weapons mentioned above”. In 2001, the U.S. administration told us that Iraq had weapons of mass destruction; Iraq was a terrorist state; Iraq was tied to Al Qaeda. It all amounted to nothing. In fact, America already knew that the only weapons of mass destruction that Saddam had were not nuclear in nature, but rather chemical and biological. The only reason they knew this in advance was because America sold the weapons to Saddam to use on Iran in 1991. What the U.S. administration did not tell us was that Saddam Hussein used to be a strong ally of the United States. The main reason for toppling Saddam and putting sanctions on the people of Iraq was the fact that Iraq had ditched the Dollar-for-Oil sales. Clearly, U.S. sanctions policies are nothing short of state-sanctioned genocide. Over the last five years, sanctions have caused Venezuelan per capita incomes to drop by 40 percent, which is a decline similar to that of war torn Iraq and Syria at the height of their armed conflicts. Millions of Venezuelans have had to flee the country. If America is so concerned about refugees, Trump should stop furthering disastrous foreign policies that actually create them. Under Chavez, Venezuela had a policy of welcoming refugees. President Chavez turned Venezuela into the wealthiest society in Latin America with the best income equality. Another much vilified leader who used oil wealth to enrich his people, only to be put under severe sanctions, is Muammar Gaddafi. In 1967 Colonel Gaddafi inherited one of the poorest nations in Africa; however, by the time he was assassinated, Gaddafi had turned Libya into Africa’s wealthiest nation. 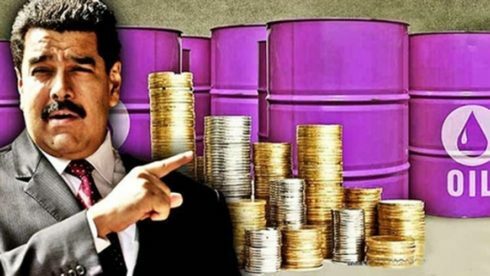 Perhaps, Gaddafi’s greatest crime, in the eyes of NATO, was his quest to quit selling Libyan oil in U.S. Dollars and denominate crude sales in a new gold backed common African currency. In fact, in August 2011, President Obama confiscated $30 billion from Libya’s Central Bank, which Gaddafi had earmarked for the establishment of an African Central Bank and the African gold-backed Dinar currency. Africa has the fastest growing oil industry in the world and oil sales in a common African currency would have been especially devastating for the American dollar, the U.S. economy, and particularly the elite in charge of the petrodollar system. It is for this reason that President Clinton signed the now infamous Iran-Libya Sanctions Act, which the United Nations Children’s Fund said caused widespread suffering among civilians by “severely limiting supplies of fuel, access to cash, and the means of replenishing stocks of food and essential medications.” Clearly, U.S. sanctions are weapons of mass destruction. Not so long ago, Iraq and Libya were the two most modern and secular states in the Middle East and North Africa, with the highest regional standards of living. Nowadays, U.S. Military intervention and economic sanctions have turned Libya and Iraq into two of the world’s most failed nations. “President Trump stated that all options are on the table”. America’s media is unquestionably the most corrupt institution in America. The nation’s media may quibble about Trump’s domestic policies but when it comes to starting wars for oil abroad they sing in remarkable unison. Fox News, CNN and the New York Times all cheered the nation into war in Iraq over fictitious weapons of mass destruction, whilst America was actually using sanctions of mass destruction on the Iraqi people. They did it in Libya and now they are doing it again in Venezuela. Democracy and freedom have always been the smoke screen in front of capitalist expansion for oil, and the Western Media owns the smoke machine. Economic warfare has long since been under way against Venezuela but military warfare is now imminent. Trump just hired Elliot Abrams as U.S. Special Envoy for Venezuela, who has a long and torrid history in Latin America. Abrams pleaded guilty to lying to Congress about the Iran Contra affair, which involved America funding deadly communist rebels, and was the worst scandal in the Reagan Era. Abrams was later pardoned by George Bush Senior. America’s new point man on Venezuela also lied about the largest mass killing in recent Latin American history by U.S. trained forces in El Salvador. Ever since 1980, the United States has steadily devolved from the status of the world’s top creditor country to the world’s most indebted country. But thanks to the petrodollar system’s huge global artificial demand for U.S. dollars, America can continue exponential military expansion, record breaking deficits and unrestrained spending largest export: weapons, chief amongst which are sanctions of mass destruction.